Guaranteed universal life (GUL) could be looked at as a combination of term life insurance and whole life insurance. A GUL can provide lifetime coverage at more affordable pricing than a whole life insurance policy. This product may be ideal for individuals who want lifelong death benefit protection, but don’t need the fancy extras other permanent products offer, such as cash value. Guaranteed universal life insurance is an affordable way to buy permanent insurance protection. As long as you pay your planned premiums to keep your policy active, your beneficiaries will receive the guaranteed death benefit when you die. If your needs change as time goes on, you also have the option of decreasing your death benefit without having to buy a new, separate policy. This can be helpful if your budget changes and you need to lower your premiums, or if your financial responsibilities decrease and you no longer need as much coverage. Some guaranteed universal life insurance policies offer a return of premium option. So, if your needs change you can cancel “surrender” your GUL policy and receive money back. The specifications of these features vary depending on the policy. The insurance companies typically only allow policyowners to cancel the policy in return for a refund during certain years. The percentage of the premiums you’ve paid that you get back can also vary. For example, one of the companies we work with allows you to surrender your GUL policy and get a refund during two specific time periods. You can cancel your policy in year 20 and they will refund you 50% of the premiums you’ve paid. Or you can cancel in year 25 and get back 100% of the premiums you’ve paid. Surrenders must occur within 60 days following the 20th or 25th policy anniversary dates. A GUL is not designed to build cash value. While a feature of GUL policies often includes a cash value component, it should not be considered a benefit because growth is typically minimal. If you’re more conservative with risk and building cash value within a life insurance policy isn’t a priority to you, guaranteed universal life insurance is a good option. With other permanent policies, the cash value can accumulate to amounts that allow you to use these funds by taking out loans against the policy. A GUL, however, is designed to be a lower cost policy option with a focus on the lifetime guaranteed death benefit not cash value. The cash value in a GUL is likely not going to generate enough to take a loan and taking a loan out against a GUL can eliminate your death benefit guarantees. A GUL is designed to be a lower cost policy option with a focus on the lifetime guaranteed death benefit not cash value. As with other traditional life insurance products, you will be fully underwritten when you apply for guaranteed universal life insurance. By fully underwritten, we mean your age, gender, smoking status, family history, and health and lifestyle factors will all be evaluated to determine your risk class—in addition to having a medical exam done. Your risk class is what determines the price you pay for life insurance. Essentially, the riskier you are for the insurance company to insure, the higher your premiums are. 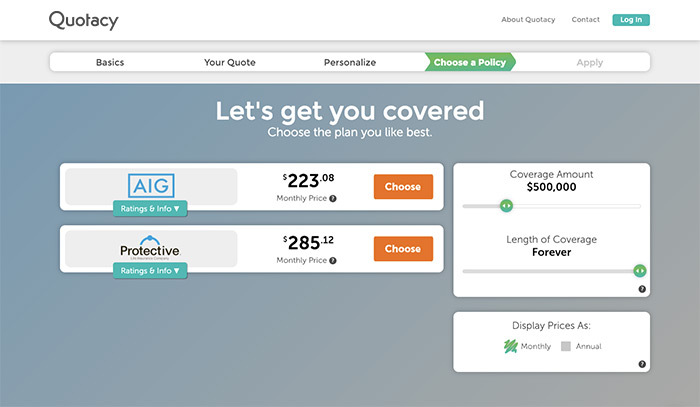 How much guaranteed coverage you want to purchase also affects the cost of a GUL policy. Again, your GUL coverage can last your entire life so whatever coverage amount you choose is the guaranteed death benefit amount your beneficiary will receive when you die. I ran a couple quotes for a healthy non-smoking 40-year-old woman. As you can see in the screenshots below, the cost of a GUL with $500,000 of guaranteed death benefit is much more expensive than a GUL with $100,000. 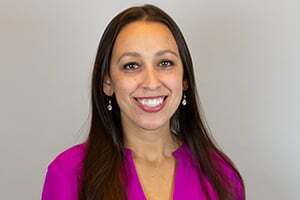 For individuals who want whole life insurance over term life insurance, it’s often because they want to leave behind some money no matter when they die. With term insurance, the coverage only lasts a specified period of time (often 10, 20, 30, or even 40 years) and if you don’t die within that time, your beneficiaries don’t receive a payout. Term life insurance is a great product for families. It’s affordable and provides protection for your loved ones during their most financially-vulnerable years, the years when you’re paying a mortgage, supporting a spouse, and raising children. However, if you want life insurance to last until you die not if you die, term life insurance isn’t going to cut it. One option is to ladder different life insurance policies. Purchase a term life insurance policy with enough coverage to replace approximately 10 times your income and pay off all the big ticket items if you died unexpectedly, for example, the mortgage and your children’s college tuition. Then, in addition, buy a small guaranteed universal life insurance policy to provide funds for your funeral, end-of-life expenses, and a small inheritance. John Smith is 35 years old. He’s married, has two young children, and is a homeowner. He’s healthy and plans on living for a long time, but should the unexpected happen, he wants to ensure his wife and their children can remain in their home and that their children can attend college without financial struggle. He hopes to live a long, happy life and die peacefully in his bed at an old age. If this happens, he still wants to leave behind supplemental income for his wife and some money for his children. John can accomplish his goals by purchasing both a term life insurance policy and a guaranteed universal life insurance policy. He purchases a $750,000 30-year term life insurance policy for $55 per month and also buys a $150,000 guaranteed universal life insurance policy for $100 per month. If John dies before he turns age 65, his family receives $900,000 in total death benefit proceeds. If he lives past age 65, his family will receive $150,000 no matter what age he dies. Who Should Consider Guaranteed Universal Life Insurance? Honestly, most families only need term life insurance. But a GUL policy is a great option for those who would like lifelong protection but their budget doesn’t allow for a whole life insurance policy. then look into guaranteed universal life insurance. You can easily compare the costs of term life insurance and GUL with our quoting tool. 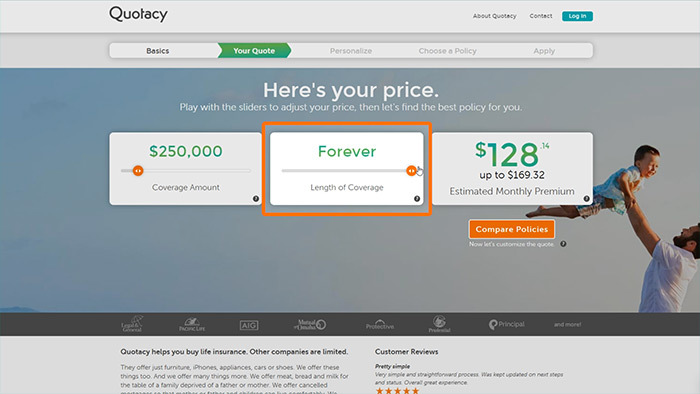 Simply go to our quoting tool, insert your basic information, and on the second page, move the Length of Coverage slider all the way to the right to “Forever”. Compare prices anonymously and then apply online in just minutes. Guaranteed universal life insurance can be looked at as a combination of term life insurance and permanent life insurance. Guaranteed universal life insurance, referred to as a GUL, has a guaranteed death benefit and as long as you pay the premiums to keep your policy active the GUL can last your entire lifetime. If you want life insurance coverage that can last your entire life but don’t need the expensive extras that come with a whole life insurance policy, such as cash value accumulation, then look into guaranteed universal life insurance. Some features of a GUL policy include affordable life long coverage, guaranteed death benefit amounts, and an option to decrease your death benefit if your needs change. Some policies also offer a return of premium option. Compared to other types of permanent life insurance, a guaranteed universal life insurance policy is quite affordable. And as long as you pay the premiums to keep the policy active, your beneficiaries will receive the guaranteed death benefit when you die. With a GUL, you also have the option of decreasing your death benefit without having to buy a new, separate policy. This is helpful if your budget changes and you need to lower your premiums. Or if your financial responsibilities decrease and you just no longer need as much coverage. As Natasha mentioned before, some guaranteed universal life insurance policies offer a return of premium option. This means that you can cancel or surrender your policy and receive your money back. The insurance companies typically only allow policyowners to surrender the policy in return for a refund during certain years. The percentage of the premiums you get paid back also can vary. For example, one of the life insurance companies we work with offers a GUL with a return of premium option. They allow you to surrender the policy for a refund in year 20 and year 25. If you surrender it in year 20, you receive 50% of your paid premiums back. If you surrender in year 25, you can receive 100% of the paid premiums. We need to note something important about guaranteed universal life insurance policies. While these policies do accumulate cash value it should not be considered a benefit because the growth is very minimal and likely won’t generate to a substantial amount. And, in fact, if you do take out a loan against the cash value it’ll affect your policy’s guaranteed death benefit so we don’t recommend this. A GUL is designed with a focus on affordable lifetime guaranteed benefits not cash value. Most families only need term life insurance but a GUL policy is a great option for those who would like lifelong protection but their budget doesn’t allow for a whole life insurance policy. So consider guaranteed universal life insurance if you have a special needs dependent, own a small business, have debt that is expected to last until or into retirement, need estate tax protection, you want to leave an inheritance, or you are older and your term policy ended but you still want coverage. Otherwise, buying a term life insurance policy or laddering multiple term policies may be a better option for you. If you’re unsure of what kind of life insurance you need a Quotacy agent can help you out. If you’re interested in the cost of a GUL, Quotacy now has added this product to our quoting tool. Simply run a quick quote and slide the length of coverage slider all the way to the right to Forever. Online quoting tools only take into consideration basic information so remember that this is just an estimate and may not reflect your final price but it can help you compare the cost of a guaranteed universal life insurance policy versus a term life insurance policy. 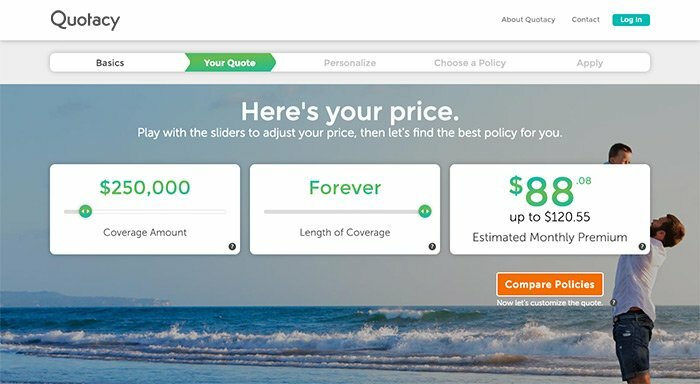 If you’re ready to apply for life insurance you can apply right online at Quotacy.com and your agent will help you find the policy that fits your needs and budget. If you have any questions about life insurance make sure to leave us a comment. Otherwise, tune in next week when we talk about how your weight affects buying life insurance.